It was McCartney's second night in Atlanta, the first night having sold out. When I first heard about Paul's new tour I contacted his publicist about getting seats for the show. And maybe, just maybe an interview?! Hey, I know we're not "Rolling Stone" or "Spin", but I figured it was worth a try, no matter how remote. I received an optimistic, “it is still a bit too early to confirm requests, but as we get closer we will get it touch." At least it wasn’t an outright “NO”. A few days before the show I got the final word, “Thanks for your request, the market is a bit tight and I am not sure we will be able to get you a ticket to review the show." I couldn’t help but chuckle to myself thinking, “hmmmm, the show is NOT sold out by a large stretch and they’d rather eat the rest of the tickets than get some press?” Fair enough, time to draw up a new plan. Having no tickets, I decided to drive downtown and take my chances with scalpers. The only "driving rain" I saw Monday was on the car trip to downtown Atlanta. Sorry folks, couldn't resist the pun using the title of McCartney’s new album. It was raining hard as a storm quickly blew into Atlanta in the late afternoon. The rainstorm was over by the time I made it downtown and I walked over to “scalpers corner”. At Phillips Arena there are signs posted that you can’t resell tickets within 2700 feet of the venue, which even includes tickets sold for face value. There were some tickets still available at the box office, but I didn't have the $50+ required. With a family, my days of using the old credit card to charge concert tickets to my hearts content are long over! And the scalpers weren’t haggling for prices either. My two hours outside of Phillips Arena was basically an exercise in “people watching”. I counted no less than 5 religious fanatics of various sects. You had a “Jews for Jesus” guy handing out pamphlets. A bearded, fellow was singing “peace and love” over and over again (and he sang for the ENTIRE two hours I was there!). This urchin had no signs or pamphlets to hand out, he was just singing with a glazed look in his eyes. Yet another man was handing out photos of the Beatles which said “collectible”. But, when you turned the picture over it was another Jesus diatribe from some church in California! I should have figured when the guy who was handing me the photo said, “if you died tonight, would you go to heaven?” And finally, you had your obligatory “Jesus Saves” sign carriers. 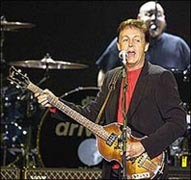 With all these bible-thumpers outside, you would have figured that Paul had said, “McCartney is bigger than Christ”. The crowd waiting in the long line to pass the metal detectors was quite a cross-section. All ages from old hippies, to middle-aged parents with kids in tow, to baggy-jeans-wearing-pierced-teens and twenty-something’s. Since the T-shirt vendor was outside the arena, several of the people in line already had their McCartney T-shirts on. The local classic rock station blasted out Abbey Road-era Beatles from their mobile van. By 9pm, I figured that it was a lost cause since the scalpers were in no mood to negotiate. Besides, it felt strange being the only person left in front of Phillips Arena that was wearing a Beatles shirt! I walked back to my car, only to hear Beatles on the radio on my drive back home! Am I bitter? Hell no, I’ve seen Macca three times during his last two tours. And from what I’ve read (Click here to read the AJC's review of Macca's Sunday night show) he put on a super performance at Sunday’s sold-out show. Besides, I got a “review of sorts” for EAR CANDY out of the experience. I can just add this to the “snubbed” archive of EAR CANDY (a small but interesting list of stories). Postscript: A few weeks after the show, I’ve been amazed by the number of live McCartney bootlegs from his new tour. I’ve been able to download no less than 5 shows of his DRIVING RAIN TOUR from the internet. From what I’ve heard on these bootlegs, I missed a helluva show! McCartney still has IT, one of those rare rock ‘n roll artists that is still vital on stage many years after his chart-topping prime.